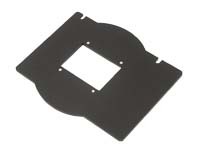 Two-piece glassless sandwich type 2¼" x 3¼" (6x9cm) sheet film format negative carrier for Omega D series 4x5 enlargers, including the D-2, D-3, D-4, D-5, D-6, and ProLab II. The image opening in these carriers has dimensions of 50.8 x 76.2mm. Note: For negative carrier information for specific Omega enlargers, please refer to our Omega Enlarger Guide.